All the first three films of Udhayanidhi Stalin as an actor have been rom-coms. After tasting huge success with ‘Oru Kal Oru Kannadi’ could not repeat the same magic in subsequent films. Now with ‘Gethu’, the producer turned actor is looking up for some substantial roles. He plays a librarian in this film, which along with his father solves a murder mystery. The film is directed by Thirukumaran of Maan Karate fame and is produced by Red Giant Movies. Udhay planned to do a a romance story titled ‘Idhayam Murali’ with ‘Endrendrum Punnagai’ director Ahmed but opted for a horror script by the director. 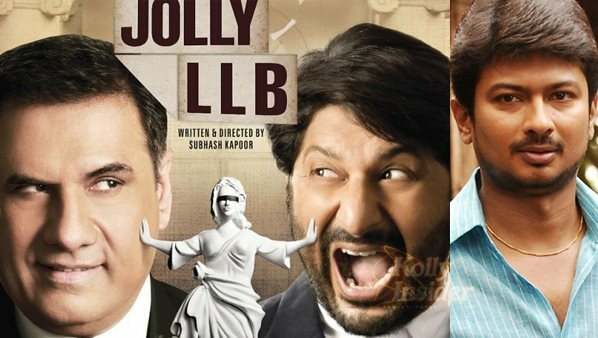 The latest news is that Udhayanidhi has decided to produce and play the lead role in the super hit Hindi film remake titled ‘Jolly LLB’ that starred Arshad Warsi and Boman Hirani in lead roles. The film was directed by Subash Kapoor and more details about this remake would be announced shortly.